Ryan Browne’s (THE MANHATTAN PROJECTS, BEDLAM) hilarious webcomic sensation GOD HATES ASTRONAUTS has expanded its readership now that it's a print series, and with that comes a huge increase in popularity—enough to sell out immediately and garner a second printing to meet customer demand. "Sold out? Are you serious?” said Browne. “I know my mom bought a couple of copies but you guys must really love your God Hates Astronauts! Wait'll you see what other awesomely stupid things I plan to force you to look at in issue two!" In GOD HATES ASTRONAUTS, a NASA-funded group of arrogant "super people" must stop a rash of farmers that have been using rocket-powered silos to launch themselves into outer space. As these Astro-Farmers fire themselves all over the galaxy, NASA must utilize their every resource (a guy with a ghost-cow head, a bunch of magic bears, and a Chicago cop with robot arms) to avoid an intergalactic incident. GOD HATES ASTRONAUTS #1 has completely sold out at the distributor level, but may still be available in comic stores. It is currently available digitally on the Image Comics website (imagecomics.com) and the official Image Comics iOS app, as well as on Comixology on the web (comixology.com), iOS, Android, and Google Play. Image Comics is pleased to announce that this first issue will be going back to print to meet customer demand. The second printing of GOD HATES ASTRONAUTS #1 (Diamond Code AUG148040) will release on 10/8. 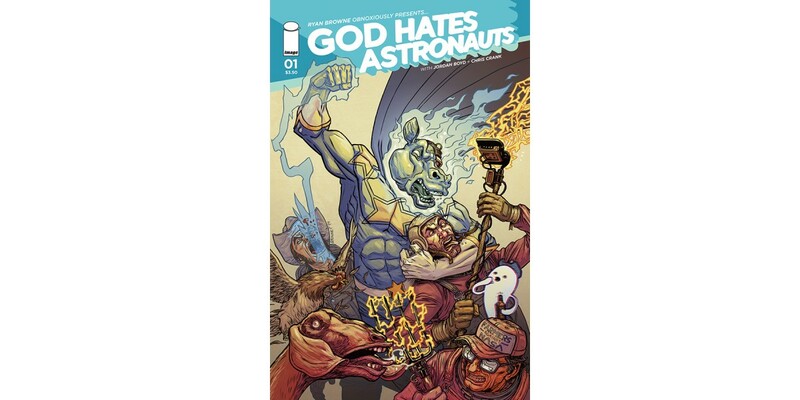 GOD HATES ASTRONAUTS #2 releases 10/1 and will be available for pre-order with Diamond Code AUG140651.